Village Voice reporter Owen goes deep inside Manhattan's nightclub scene and uncovers the sinister sleaziness inside the glamorous exterior. 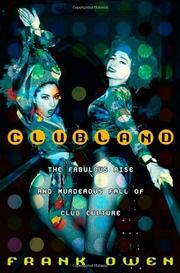 Everyone knows there's more to club life than shocking hairstyles and fierce DJs. But during years of on-the-scene investigation, Owen finds things far more troubling than Ecstasy overdoses and backroom brawls. Prostitution, theft, drug addiction, and murder throng under the disco ball as he explores the empire built in New York by nightlife king Peter Gatien during the 1990s and the multi-pronged campaign waged by the government to bring the impresario to his knees at any cost. While undercover agents fabricate evidence against Gatien, the entrepreneur is off on drug binges with hookers; while his Mob-connected underlings rat each other out to gain an edge over their rivals, innocent—or relatively innocent—people are killed in the crossfire. Crime abounds inside and outside the clubs, and as the case against Gatien grows, so do the number of shady deals various criminals cut with authorities to save their own hides and settle old scores. Incorporating endless interviews with every character even tangentially connected to the plot he narrates, Owen's reporting is exhaustive. Sometimes, unfortunately, it is also exhausting: so much double-crossing, backstabbing, and deal-making is a bit excessive for anyone not utterly wrapped up in the club scene. It doesn’t help that owners, promoters, ravers, dealers, attorneys, narcs, and thugs alike are all utterly despicable and loathsome, making it hard to muster sympathy for any of these lowlifes and even harder to sustain interest in their plights. Owen does an admirable job of surveying his subject from every angle, but there isn't a single one that makes the picture any less ugly. Expertly reported, but not for the squeamish.